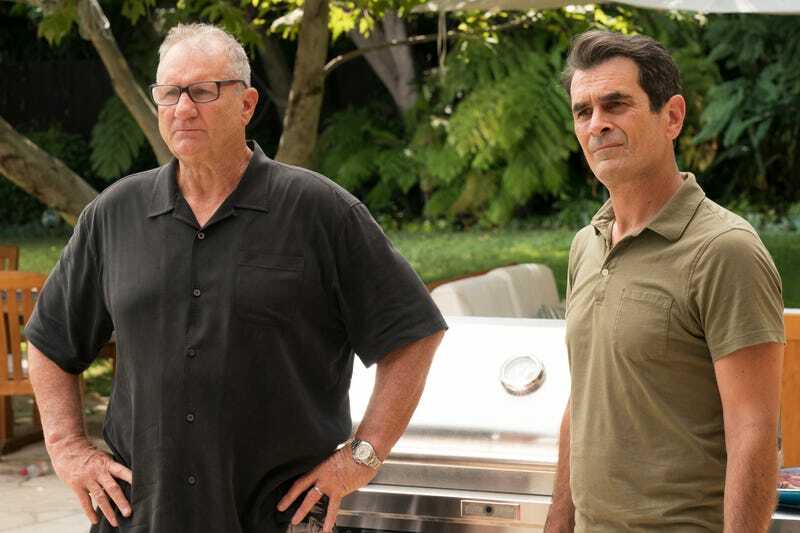 When Modern Family is really delivering in terms of storytelling, it’s usually because it’s using seemingly separate storylines to muse on similar ideas and themes. The ensemble sitcom more often than not reverts to chaos when it comes to its various episodic stories. There’s little rhyme or reason to what’s going on, and while that can create some genuinely funny comedy, it doesn’t do much to progress the season’s character arcs. In other words, you need episodes like “Kiss And Tell” to get the season moving. After a sluggish but decent enough premiere, “Kiss And Tell” is exactly the kind of episode Modern Family needs to prove that there’s some sort of plan for these characters in this tenth and final season. Now, there’s one glaring annoyance when it comes to these kinds of episodes, where each plot thread serves to contribute to a larger thematic musing: that damn voiceover at the end. Modern Family has employed its episode-ending voiceover in different ways throughout its run. It was predominant in nearly every episode in the early seasons, and has been used sparingly as the sitcom’s aged. Using them intermittently was a smart choice—not every episode calls for the same kind of coda—but that’s led to a larger issue, which is the show relying on the voiceover to really spell out the theme of the episode. At the end of “Kiss and Tell,” Haley’s monologue wanders through ideas of honesty in relationships. It’s a natural fit; she’s reckoning with Arvin’s absence and her impromptu kiss with Dylan, so of course she’s struggling to figure out what honesty, both to the people she’s involved with and to herself, looks like, but does it really need to be laid out so plainly? It’s always a little frustrating when an episode spends a lot of time doing some emotional heavy lifting, only to then rely on the most basic storytelling trick to really hammer the point home. With that said, it’s really only the end of “Kiss And Tell” that’s exasperating. So much of what comes before is remarkably likable and funny. The stories themselves are low-key funny, but they’re imbued with emotions that feel fragile and real. I don’t expect Modern Family to really go down the road of relationship conflict with anyone significant like Cam and Mitchell—in the way, say, that Blackish did with Bow and Dre—but it’s still encouraging to see relationship issues, however big or small, making an impact ten seasons in. That’s no easy feat. At this point everyone except the kids is pretty settled in their relationships, and there’s very little the show can do to create conflict that doesn’t feel contrived or completely outlandish. “Kiss And Tell” boasts quite a few exceptions, as it focuses on issues of honesty, in its various forms, in a variety of relationships. There’s the honesty between mother and daughter, as Claire struggles to get Haley to open up to her about her kiss with Dylan. There’s the honesty between Phil and Jay, an honesty that’s never been there despite a hidden respect and admiration between them. Then there’s romantic honesty, with Haley unsure about telling Arvin the truth, and Cam and Mitchell differing in their advice to her. That question, of whether being honest about a brief moment of infidelity that’s perhaps unimportant in the grand scheme of things, kickstarts the episode’s plots. Haley seeks out Cam and Mitchell’s advice, but they give her different answers. Cam thinks it’s important to always be honest in a relationship, while Mitchell thinks that hiding something insignificant can benefit the relationship in the long run. That leads to Cam fretting over Mitchell’s potential past indiscretion. What’s nice is that “Kiss And Tell” doesn’t drag out the mystery. Instead, Mitchell lays out his slight infidelity, which was kissing a man in a bar six weeks into his relationship with Cam, and before they had agreed to be exclusive. Mitchell and Cam’s dynamic throughout the episode allows the storyline to avoid the predictable pitfalls. Rather than wallowing in resentment and anger, Cam puts on an air of being offended while Mitchell can’t help but laugh it all off because, as he simply puts it, “we’ve been married for fifteen years.” It’s refreshing to see Modern Family avoid hysterical conflict; instead, this feels more grounded in character. Cam is insecure and needs to be reassured, and Mitchell doesn’t mind ribbing him a bit before affirming his love. For better or worse, that’s their relationship. For the second straight week, Claire’s story is a lot less interesting. Her character is just kind of flat at this point. The show seems to be trying to put her through an existential crisis of sorts, as she’s needed less and less by her kids as they grow into adults. I’m curious if anything comes from that spark of an idea, but right now Modern Family is simply scratching the surface, and that’s not very compelling. Claire’s worry about not being close enough to Haley in a way that allows her daughter to open up is interesting in theory, especially because Claire has spent so much time judging Haley and praising Alex. In practice though, there’s only the suggestion of something more meaningful. Maybe Modern Family will one day do something more meaningful with Manny as well. Giving him a girlfriend, who’s decidedly real and Canadian, is a start, but rolling out a contained story where some of the family questions Manny’s sexuality is more than a few steps backwards. You can only go to the “is Manny gay?” well so many times over the years before it becomes reductive, boring storytelling, though perhaps it was that from the very beginning. But at least there’s some character development here, even if it’s simply in the form of Manny having a romantic partner. The bottom line is that “Kiss And Tell” works because it’s starting to put together character arcs that matter. Haley tells Arvin about her kiss with Dylan, goes back to Dylan and makes out with him some more, and then admits to herself that she’s in love with two people. Manny reveals he has a girlfriend, Phil and Jay grow closer after trying to push each other away, and Alex and Luke...well, they’re still just Alex and Luke. But Modern Family is at least starting to focus on an area where there’s still plenty of stories to tell: the kids. Maybe this will be their season, and lead to that rumored spinoff from ABC down the road. I absolutely love the gag where everyone has no idea why they’ve gathered for a pool party at Jay and Gloria’s house. Did Alex win an award? Is it Manny’s “welcome home” party? Nobody can figure it out. I also love the meta touch of Cam and Mitchell having a deep conversation before taking their issue “to the room.” The camera follows them a few steps into the living room, where Mitchell says, “I assume you all heard that?” and everyone agrees. Like a middle-aged Phil, I have also never seen Mean Girls.